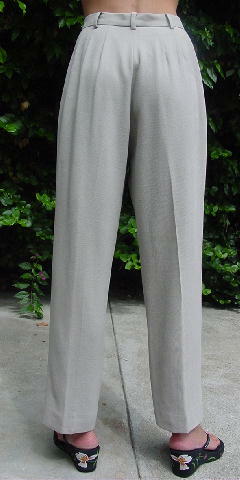 These champagne-bone color pants have a shell of 100% virgin wool and a full lining of 100% rayon. 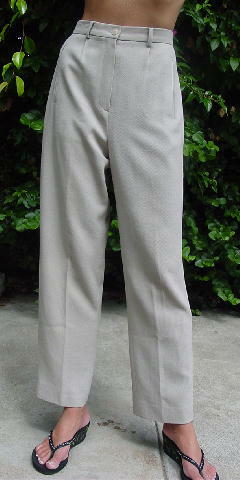 They have a 1 3/8" wide waistband and a 2 button closure (1 exterior, 1 interior). There is a 6 1/2" long front zipper fly, belt loops, and faux vertical slash pockets. 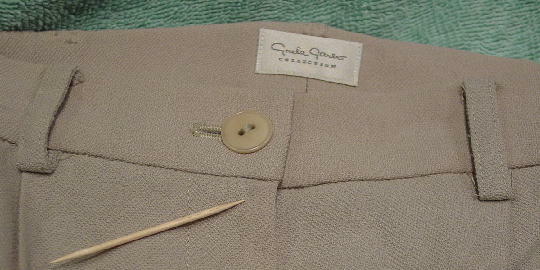 They were made in Italy and are from the Greta Garbo Collection. They have an extra button. There is a small grayish spot by the top of the fly. They were worn in a photo shoot for a foreign magazine.